Theddlethorpe Academy pupils show off their brand new playing field and some examples of the new P.E. equipment. Pictured are: (l-r) Eve Hallam (9) Year 5, Lewis Shaw (10), Jake Deeley (11) both Year 6, Lacey-Jo Martin (9) Year 5, and Lacey Wright (10) Year 6. Tollbar Multi Academy Trust is investing more than £500,000 in improvements to its academies as student numbers continue to grow. Theddlethorpe Academy has seen a 20% increase in pupils since it joined the Trust last year. Reynolds Academy is now over-subscribed, and Somercotes Academy will see its first full intake of students in the autumn term. Tollbar MAT Sixth Form College has a record number of applications for places in September 2017. Improvements at the academies continue at pace. Theddlethorpe Academy now has a brand new school field after the Trust bought one acre of farmland at the rear of the academy with planning permission granted for conversion to leisure use. Theddlethorpe Academy has never owned its own school field, and the farmland has been levelled and planted with a new natural perimeter hedge and has been grassed ready for use this term. 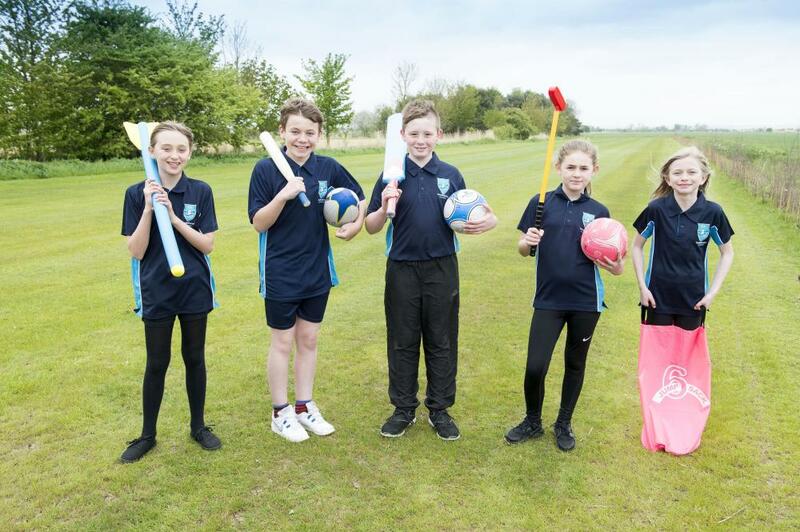 The Trust has also provided a range of new sports equipment for pupils to expand their P.E. lessons. The Academy will also have two new classrooms built adjacent to the main academy building, at a cost of £130,000, financed by a DFE grant for capital expenditure. This will allow all year groups to be taught in separate classrooms and free up the school hall for other uses. There will also be extra parking. Further improvements at Theddlethorpe Academy in recent weeks include a brand new catering service, provided by Aspens, who offer freshly-cooked food daily, resulting in a rise in pupil numbers for school meals. All classrooms have also been fitted with interactive white boards and new teaching desks, and the heating has been upgraded throughout. Theddlethorpe Academy Principal Mandy White says pupils and parents have embraced the changes brought by Tollbar Multi Academy Trust. 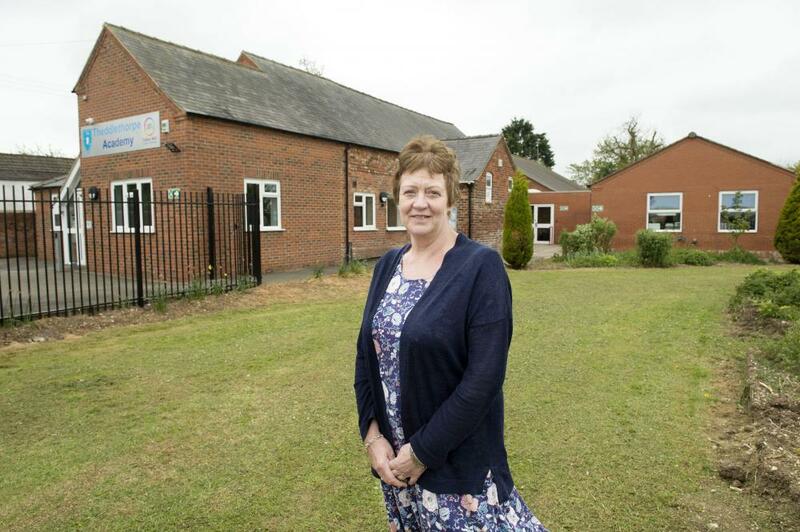 "The response from pupils and their parents in support of the changes we have made at Theddlethorpe have been extremely positive," she said. "The children are delighted with the new field and the new classrooms will make a big difference as all year groups will then be taught in their own classrooms." Pupil Lewis Shaw (10) said: "The new school field is amazing. It's like Wembley." Theddlethorpe Academy Principal Mandy White stands on the land where two new classrooms will be built in the coming weeks. Work has also begun to build a new classroom at Reynolds Academy, which is more popular than ever. The aim is to create a new classroom for Year 5 pupils, creating three classes each for both Year 5 and Year 6 pupils. This will allow class sizes to remain small, at around 20 pupils. The academy has also had a brand new CCTV system fitted. At Tollbar MAT Sixth Form College, students will soon have a brand new Art studio with panoramic views. The studio will be built on top of the existing Common Room, expanding the Art facilities. The college has also been rebranded, with new signage throughout and along its perimeter, indicative of its status as the Academic Choice for studying A Levels. The college has a record 370 plus applications for September 2017. Following the completion of exams this summer, Somercotes Academy's IT Suite will undergo a total refurbishment, including the installation of a new server and IT Helpdesk. New doors and windows will also be installed and the corridor walls will be fully lined. David Hampson, Tollbar Multi Academy Trust Chief Executive, said: "All of the academies within Tollbar Multi Academy Trust continue to expand their pupil numbers. We have always pledged to provide the best learning environments possible for our students and younger pupils. These latest improvements are possible due to astute financial planning and the award of the School Condition Allocation Funding; all of which will have a positive impact on the education of our students." David J Hampson OBE, BSc, BA.